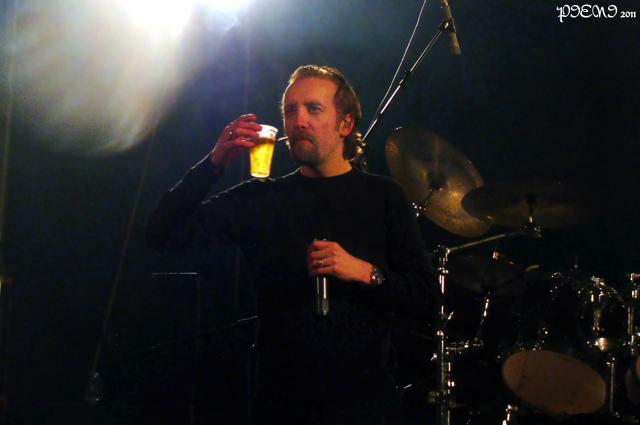 If you’ve never been to a PARADISE LOST show, there’s something you need to know: there’s 5 guys, but the way the gig goes depends on the mood of one and only – singer Nick Holmes. If he’s in good spirits, you can be sure you’ll experience a hell of a show. If he woke up on the wrong side of the bed, you’ll probably wish you’d stayed at home. I don’t know where the fest promoters got the idea PARADISE LOST would perform the whole “Draconian Times” album (assuming they really thought they would and it wasn’t just a cheap trick to sell more tickets ). GSM had announced it on Facebook, but on the band’s official website there was nothing that indicated so. So I sent an e-mail to the tour manager, who took only a few hours to reply to me (thank you, Mr. Bolton). The gig did start with “Draconian Times” first song, “Enchantment”, but it was no surprise to me when the following song was “I Remain”, from their latest album “Faith Divides Us – Death Unites Us”. I had a small hope they would play “True Belief”, but the only “Icon”-song they performed was “Embers Fire”. Good enough. People were complaining that the show was pretty short. It felt like that, yes, but hey – it was a festival, not a PARADISE LOST concert of their own. Couldn’t ask for more than the hour and something they’ve played, really.